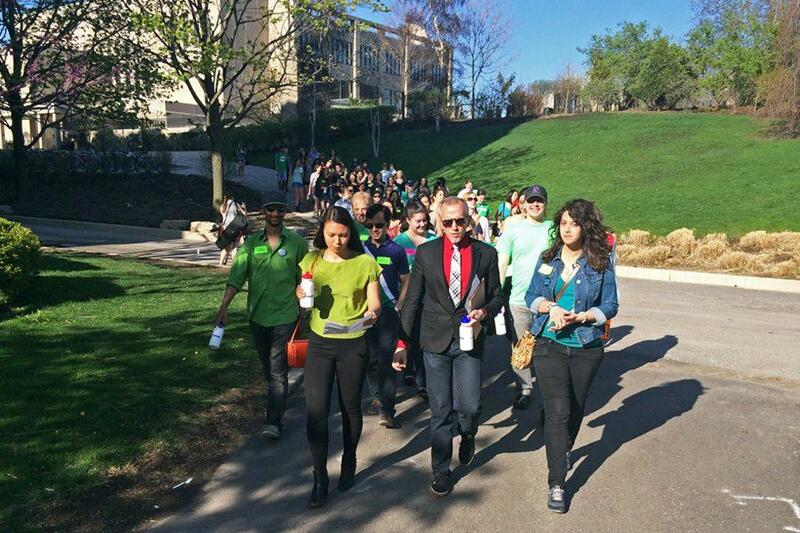 Ary Hansen, former co-president of NU Active Minds, John Dunkle, executive director of CAPS, and Amanda Meyer, former co-president of NU Active Minds, lead the "Stomp Out Stigma" march in 2014. This year, NU Active Minds formed a new committee to strengthen its internal programming. NU Active Minds is aiming to strengthen its internal programming with a new community engagement committee. The organization, a student group that aims to promote education and dialogue surrounding mental health on campus, wants to focus on building its community internally, said SESP senior Sunhee Han, NU Active Minds co-president. The committee will be responsible for choosing topics to present to the club, planning different mental health-related workshops and organizing various speakers and social events for members, said Weinberg junior Amy Kuang, the group’s other co-president. The group’s annual “Stigma Panel,” in which students speak about their experiences involving mental health, will take place in November. The group will also organize programming open to all NU students during its annual “Stress Less” week. In the past, NU Active Minds has mainly focused on outreach events to engage the student body in discussions surrounding mental health, Han said. Last year, NU Active Minds hosted the “Send Silence Packing” exhibit as a representation of the lives lost to suicide, and a year prior to that, the group organized “Stomp Out Stigma,” an event during which students marched on campus to build awareness of mental illnesses and the stigma that is often associated with them. New this year, NU Active Minds is also hosting general meetings every two weeks for all of its members. Each meeting will focus on a specific topic dealing with mental health and wellness, sparking dialogue among members and providing a space for members to talk about their own experiences, Kuang said. Along with its efforts in building community within the club, NU Active Minds also plans to continue their outreach efforts to encourage the Northwestern community to eliminate stigma surrounding mental health and illnesses, said Weinberg senior Jacob Swiatek, NU Active Minds special events chair. The group plans to offer workshops and firesides to residential colleges and other student groups to help destigmatize mental illnesses, Swiatek said. The club is also working with the Interfraternity Council on providing additional workshops to all new members in IFC, he said.